Log In and Claim Your BitStarz weekly bonus! BitStarz Casino members can access a variety of promotions this week, whether they are interested in a no deposit offer, cashback bonuses, or even free spins on their favorite slots. 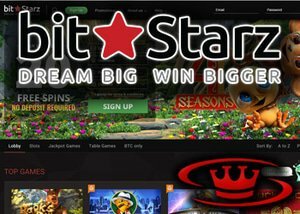 Every single Wednesday at BitStarz Casino is Free Spins Wednesday. Players need to make a deposit of at least 50 mBET or €20 and then wager the same amount as their deposits in order to get 20 free spins on Boomanji or Fruit Zen. These free spins can be claimed the following day (Thursday) at 11:00 CET. Existing BitStarz players also have a great reason to be excited this week as the venue is handing out as much as €10 or 50 mBTC per day as a cashback bonus. This cash bonus applies to those who play selected games, which include Platinum Lightning, Billyonaire, Fairytale, Eye of Ra, Guns 'n Roses, and Tipsy Tourist. Anyone who does not win on these games each day can claim their €10 cashback rewards. BitStarz Casino is home to some of the world's most popular online slot machines, and those who sign up for an account can receive 20 free spins with no deposit required on the Boomanji or Fruit Zen slots. To top it off, when they make their first deposits with the casino, they will also receive 180 more free spins on top of their 100% deposit matches worth up to €100 or 1 BTC. It's a great time to be a member of the BitStarz Casino, but there are also promotions for those who are just signing up. There is a lot of free cash and free spins to be had, so be sure to check it out this week, only at BitStarz Casino.